Fried chicken ramen with a simple shio and a side of chicken tenders. It isn't standard procedure for a struggling restaurant to turn 180 degrees on a dime — to close for business on a Saturday and reopen on a Tuesday with a brand-new concept, serving an entirely different type of cuisine, with a menu drawn up and developed in a matter of weeks. But Daniel Patterson has never been a chef who has done things the typical way. His Uptown Oakland restaurant Plum was unique in the neighborhood in terms of the kind of high-end, labor-intensive, modern Californian cuisine it served. Patterson remains convinced that if he'd opened in San Francisco, the restaurant would have been packed every night — but he didn't, and, especially toward the end, it most definitely wasn't, despite a long procession of chef shuffles and concept tweaks. So, Patterson decided to reopen the place as Ume (Japanese for a kind of plum), drawing on the affinity that he's always felt for Japanese cuisine — its simplicity, emphasis on great ingredients, and precise cooking techniques. Ron Boyd, the director of operations for Patterson's restaurant group, helped him put together the initial menu. Brett Cooper, formerly of Outerlands and a star chef in his own right, tweaked some dishes and worked the line, on a consulting basis, for the first few weeks. And now, Dong Choi, the chef de cuisine, is running the show. 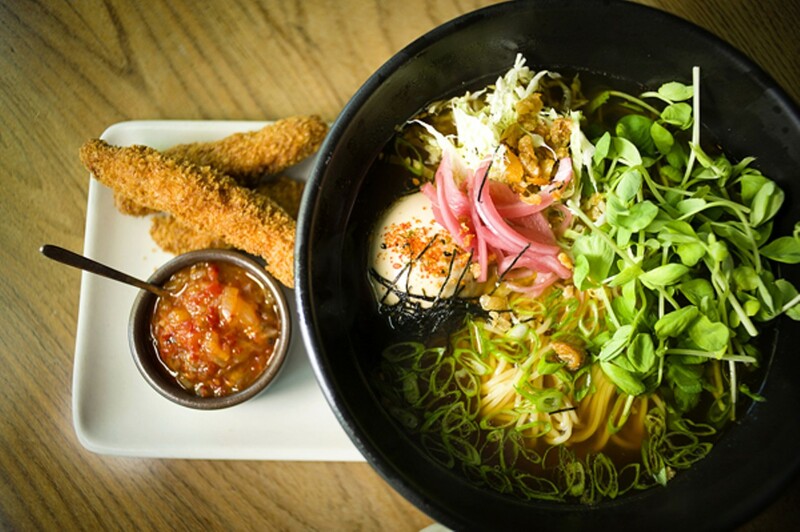 The concept isn't Japanese food so much as Japanese-inspired dishes crafted with Northern Californian ingredients, including high-quality miso and tofu made in the Bay Area. To be clear, Ume makes no pretense of serving traditional Japanese food. As Patterson put it, "We're California people cooking California food, with an eye toward Japan." A meal at Ume should start with an order of puffed brown rice crackers, a twist on a starter Patterson serves at his flagship restaurant, Coi, that doesn't look much like anything you'd find at a traditional Japanese restaurant. Overcooked brown rice is blended, dehydrated, and then dropped in hot oil until each cracker blisters and puffs up, gloriously, to form airy, chicharrón-like slabs. At Ume, these are dusted with "umami powder," made from dried seaweed that's infused with a hit of fermented fish sauce funk, so that the final product is reminiscent of the shrimp chips sold at Asian markets. This is perfect drinking food. Another small plate combined delicate strips of yuba (tofu skin), roasted maitake mushrooms, soft-scrambled eggs, and a sprinkle of dried-seaweed strips — layers of umami, by land and by sea. It's a brilliant dish — all of the custard-like juiciness of chawanmushi (Japanese steamed egg custard), reinvented in the form of soft-scrambled eggs. The best dishes I tried had a beguiling, if not quite monastic, simplicity. A grilled chicken thigh was served, yakitori-style, naked but for a wedge of lemon on the side. But what a thigh this was — brined in dashi and grilled over binchotan charcoal until the skin was half-crispy, the fat rendered just enough so that you could bite clean through the impeccably tender flesh. Yuzu kosho pepper paste, brushed on during grilling, added a pleasant, low burn. There's nothing to hide behind when a meal is stripped down to so few components, but at Ume, dish after dish impressed me with clean, bright flavors and pitch-perfect execution. Grilled squid, served with the tentacles intact, was tender and smoky, accented with just a hint of lemon. Chinese gai-lan were served standing upright — leaves charred crisp like kale chips — in a bowl of rich, aioli-like "misonnaise." And I guarantee you won't find another Daniel Patterson restaurant that will serve you a simple bowl of cherries for dessert. The most elaborate dishes that I tried were the larger "bowls," which, priced at under $20 for a hearty, shareable portion, offered the best value. 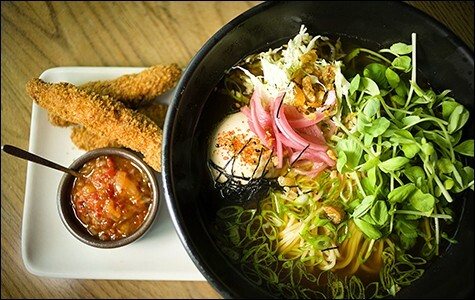 Of these, the showpiece is the fried chicken ramen, which combined springy noodles, a creamy-centered six-and-a-half minute soft-boiled egg, and a more-complex-than-it-appears shio (salt-based) chicken broth with a soy sauce tare added at the last minute to give the soup a smooth, deeply satisfying flavor. On the side were probably the best chicken tenders I've ever had: Marinated with shoyu, brined in dashi, and coated with panko rubbed with bonito flakes, these were astoundingly juicy in addition to being an umami bomb — the bonito added a cheese-like richness. In some cases, the dishes with bolder flavors could have used a more restrained hand. The vegetarian miso tofu ramen — topped with grilled corn, little pickled long-bean segments, raw pea shoots, and agedashi-style fried tofu — featured a thick, viscous broth whose only failing was that it was way too salty. Another bowl combined braised oxtail, pungent house-made kimchi, and a ginger vinaigrette. Choi, who is of Korean descent, grew up with these flavors — he said that, to him, "oxtail and kimchi go together better than peanut butter and jelly." While the oxtails were as lusciously slow-braised as a person could want, it wasn't until I got a little bit of the garnish — strands of frilly garland chrysanthemum — in each bite that the dish came together. The fragrant herb helped mellow out the harsh combination of flavors. To nitpick for a moment, the restaurant still feels a bit fussier than it needs to be. That fried chicken ramen was straight-up delicious — but we ate it with unwieldy, stubby little soup spoons that were all form and no function, and then struggled to scoop chili sauce with a tiny wisp of a metal spoon, that felt as though it was made for a mouse. Part of the problem is that the dining room was still half-empty during my visits. That really shouldn't be the case — not with food that's this good and service this friendly and enthusiastic. And while Ume isn't inexpensive, the prices are significantly lower than any of Plum's iterations. If you order wisely, you can eat well for around $30 a person. All of which is to say: Ume is on its way to becoming the kind of low-key neighborhood restaurant it aspires to be.